Standing in front of the class, I concentrated on breathing deeply through my belly like I had been taught. I thought about things like releasing my jaw and keeping my knees relaxed. I had been standing in front of the class for about three minutes. I was wearing my regular street clothes, and they were just…watching me. A litany of thoughts flew through my head. “Am I doing this right? My neck hurts. Why is Sally looking at me like I have something hanging from my nose? Oh, I hope I don’t have something hanging from my nose.” And on this went for what seemed like an eternity. Finally, about two minutes later, the teacher called out, “time.” I took my place with the rest of the class and sat down. When I was in acting school, we did an exercise where we had to simply stand in front of the class for five minutes. No talking. No acting – with gestures, facial expressions, or anything. Just stand in neutral position for five minutes. The idea was to teach us how interesting human beings are by themselves without any added effort. I found that exercise one of the most profound things that I learned. Humans are inherently interesting. Watching classmate after classmate go through this, you could see the litany of thoughts happening on their faces and in their bodies, even when they were trying to remain calm. I often think about this exercise when artists tell me they don’t have anything to blog about, talk about in their email marketing, or share on social media. Artists often tell me that they don’t think they are that interesting. If a person just standing there can be interesting, I think an artist can certainly be interesting. In the Content Marketing for Artists blog post, I mentioned that I would talk about how to use stories to sell your art. This is that blog post. Joseph Campbell, the guy that came up with “follow your bliss,” came up with a concept that I find very compelling – the Monomyth. Campbell said that most myths contain some common elements – heroes start out as lowly mortals, they receive some sort of call to adventure and divine assistance to get started, encounter obstacles along the way, go through a transformation, and return to where they started as a hero, changed for the better. We all recognize this basic structure in many popular stories. Stories as old as Beowulf follow this structure, while new myths like Star Wars follow it as well. Luke Skywalker, a nobody on a remote planet, meets his call to adventure when a messenger from heaven (R2D2 & Princess Leia) summon him to help in the battle. Luke meets with adversity, must learn to use the Force, suffers defeat and nearly death at the hands of Darth Vader, but comes out the other side stronger, wiser, and eventually victorious. Many books and essays have been devoted to examining the Monomyth. We’re only going to brush the surface here, but if you want more resources for reading, I can recommend Dramatica: A New Theory of Story and Tracy Hickman’s wonderful essay The Mythic Journey. In the context of telling the story of your art, it’s easiest to think of the Monomyth as a way to structure the story of you as an artist, and your art, to your collectors. If you can do this well, you will get and keep their attention. Let’s take a look at the story elements and see how they fit with your art. At some point in your life, you were called to be an artist. Perhaps you woke up one day and realized that your interest in drawing was more than a passing interest and you wanted to devote your life to it. Perhaps there are subjects that you want to talk about in your art that are important. These are the things that you want to use to introduce yourself to collectors. Some art buyers want to know what inspires you to make art – what the meaning is behind what you do, and where it comes from. The origin story is exciting to them. While it might be rather mundane to you, I can assure you that it’s not to them. Many people feel the calling to become artists, but only a few actually follow through on that calling – so why did you do it? Who, or what, was your Princess Leia distress call? When did you realize that you needed to take action and become an artist? Gwenn Seemel’s Bio page on her website is a good example of how to do this well. People love a good underdog story. They love to hear about what happens when their heroes meet opposition – so play that role! I firmly believe that a big part of the reason people love open studio events so much is that they get to see works in progress. They get to talk to the artists and hear about their artistic process. All good stories have an obstacle to overcome. You might not have some great tragedy in your life, but every artist meets adversity and Resistance when it comes to creating their work. Generally, the deeper you delve as an artist, the harder it is to bring your work to life. Those difficulties are the very things that you should talk about in your Content Marketing efforts. These are, of course, just a few ideas. Every artist sinks into the creative abyss to do battle with what Steven Pressfield calls Resistance. Some times you have to hide away in your studio to make something truly great. You’d rather be in the studio anyway, right? I go through periods where my artistic muse grabs ahold of me and drags me into the deep. 2011 was a big year for this. I spent the last half of the year stuck in a morass of writing my first one-man show. I virtually stopped blogging. I didn’t do any other shows or write anything else. It was all consuming. After you come out of that dark fertile period, though, you’ll have plenty to talk about. The really brave artists will be rewarded by sharing the things that truly matter. You will have a new piece of art to share or perhaps a new outlook on life. By reaching out to your collectors during and after these dark times, you will find that many of your collectors are not just collectors, but true fans and people who are willing to support you. A burden shared is a burden halved. At some point, when you emerge from the abyss of creativity, you will have this bright shiny idea at some stage of completion (I know, an artist’s work is never actually ‘done’). That’s when you turn around and make the offering to – whoever it is that has the power. Campbell calls this stage the Atonement. You recognize the being with the power – in the artist’s case it could be the collector, the gallery owner, or the Internet at large, and make them an offering. 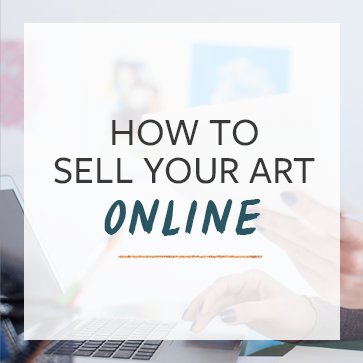 Whether you directly ask for the sale, you ask people to share a new piece you’ve created, or you ask for gallery representation, you have to make the offer or request. One of the primary mistakes that artists make in their online marketing efforts are failing to make the ask – and then not letting themselves get down if the results aren’t what they want. Don’t get in your own way by not making the offer. At the end of the story, the hero always returns home a changed person. He celebrates with his family and friends. You should do the same. Share your victories with your friends – whether its a big sale, a new solo show, or just finished a great piece of art. The principle of returning to report is necessary. I know that frequently after I go through an extraordinary journey I often don’t realize how much I’ve grown until I try to communicate it with other people. Writing about it, thinking deeply about your experiences, is a way to learn at a deeper level. Keep in mind that the Monomyth is just one way of telling a story. There are some legitimate criticisms of Campbell’s idea, but it works well as a way to structure a story. What I’m really trying to communicate is that putting yourself at the center of the story of your art is a powerful way to communicate the ideas of your art and connect with your readers. People like the structure of hero stories. It holds their attention. You need a way of getting and keeping collectors’ attention. There’s a marketing axiom that says it takes seven encounters with a brand before someone is willing to make a purchase. Storytelling is a great way to develop your personal brand as an artist. There are many ways to tell a story. It doesn’t just have to be written – you could use video, audio recordings, or your art to tell your story. In the next blog post, we will talk about ways to tell your story beyond simple blogging. Have you learned to tell the story of your art? As a writer, everything you say here is true–even for us wordsmiths. Letting people in to the creative process, to how we sweat and bleed over our work–people really eat it up. Great post. Thanks, Cory. I love stories…but am not good at writing them. Perhaps now is a good time to try it out. On my original website (before I cleaned it all up and made it better. It’s a work in progress) I told my story as a fairy tale in a way. Your post has inspired me to revisit that idea. I struggle so much with actually talking about myself but I can tell a story. I’d love to read that Donyae! Great post! It’s reaffirming to see this journey written down so clearly, thanks! I don’t often comment although I love your posts However, this one today is so meaningful to me. I am a writer and visual artist. I have often considered writing stories around the art, but have hesitated as I didn’t want to seem so self serving. This shows me that actually, it serves others who may not have the artistic flair, to understand and be a part of the art the view or hopefully purchase. Thanks. Thanks for commenting Harmony! You’re absolutely right – and it’s hard to get out of our own viewpoint about our art. Thank you for this .It is just what I needed at this time in my journey. I see myself at the point of revelation as I begin my creative art business and hope to give back by helping others attain their dreams. I love your site and have attained great inspiration and encouragement from your writing. Seeing the diagram is awesome ! I love this post. Although I feel the most important transformation events in my life are too personal (or too “out there”) to share with the public, perhaps I can think a few that I can share. Perhaps this will help me out with my “I’m boring” complex. wow Cory! Well done! Okay, you got me back. I was ready to quit ya and ya got me. Nice combination of the practical ( which is what I most appreciate about the abundant artist) and the Jungian myth stuff. Great metaphors, Cory! I actually teach this Monomyth in my English classes. I’m pretty good at generating stories and content about my art…though sometimes with abstract pieces it distracts people. I’d just like to point out that in any good art piece, there are probably three good stories to tell about it, not just one… any good art is very multi-leveled. How do you fit this content marketing into increasing sales? Once you have some stories, what do you do with them? Blog them? Post them on Facebook? What’s the next step? Great question Suzanne! We’ll be addressing what to do with your stories over the next couple of blog posts! What a wonderful piece to read this morning! I have blogged about some of my “stories”. When I have really really spilled my guts, the best things happen! Sometimes, nothing happens – but people still seem to want to read about my boring life, even when there’s “nothing” to say. Wonderful article – inspiring and useful, the best kind. Post a link when you’re done. Would love to read it! You have to be tactful with this approach. I know of artists who have went this route… and the info they share comes off as ‘woe is me, please buy my art’ spin. Write about your struggles… but don’t try to force them into being a selling point. If you write about life struggles — if you make it part of your brand — I, for one, think that it should have a solid connection with the work that you create. In other words, don’t hit readers with a story about how you were abused by your spouse… unless you can link that directly to your work in some way. Anything less comes off as a call for a mercy purchase. You want people to buy your art because they believe in it… not because they feel sorry for you. Again, I just think it is important to be tactful depending on what is shared. And remember… there has been a lot of info lately about how sharing personal info, specifically over-sharing, can impact people on websites like Facebook. People can get ‘turned off’ if you go too ‘deep’ with the ‘personal stuff’ frequently… regardless if it has a ‘happy ending’ or not. At the same time… I suppose if you lost a fan over sharing too much — perhaps they were a fan of your art for the wrong reason. A good point. How much is too much, either in terms of self-revelation — which might detract from the art, not add to it– or potential over-explaining of an art piece? Here we enter the territory of differentiating the life of a creator from the created piece. Not to get all English major on ya or anything, but it is interesting in the context of the new ability to tell all to everyone via the internet. Definitely great points Suzanne and Brian. I think you can go too far. The line is probably different for each artist, as different audiences prefer different messages. The way you craft the story is key. As a storyteller, I’ve seen some tellers reveal some deeply personal things in a way that is very moving, and I’ve seen others reveal some fairly shallow Jr High kind of things that made the audience uncomfortable. GREAT post! I was familiar with the parts of the monomyth, but had never thought to place myself at the center of it. I had always viewed it as a literary device and little more. Glad to see I was wrong! Thanks for opening up a new view for me! Great article! I’ve shared it with my readers over at my blog, in hopes that they’ll enjoy it just as much as I did. Thanks for the tips! Inspiring blog. I feel like I’ve been doing this fairly well except now I am going to add something. When I am working on my art it often teaches me a life lesson and now that I think back to my last painting I don’t know if I can remember what its lesson was. From now on I’ll have a blank page open on my computer to randomly journal as “deep thoughts” come up. Painting is such a reflective time for me and this would be so great to share. Rachael, I love what you said about painting being a reflective time, it is exactly the same for me with drawing. I will definitely take up the lead of making notes of thoughts and feelings that emerge while drawing, what a great idea! Especially since a comment by a friend about one of my drawings just recently made me realize that people looking at the finished piece may catch a glimpse of the emotions you were experiencing while making it. I find it very difficult to talk about myself or write about my work. It’s also very unsettling to put your work out there. Does anyone else go through this? Just wondering. All the time. I also cringe when a customer asks me about my inspirations or reasons for creating a particular piece. Sometimes I fear that they’ll be disappointed if I tell them that I have just thrown something together. Confidence and belief in my work have always been a problem to me, even during spells of reasonable financial success. I don’t really have problems talking about my art or telling people what it means to me, how it came about, etc. I don’t have problems telling them how I became an artist or why. But asking for a sale in my online site? How do I do that? So far, I am only marketing via Fine Art America and virtual worlds. I have sold quite a lot of virtual copies, which gave me a lot of confidence in the quality of my work, as many very fine artists are there and doing the same. I only make digital art, so no original to sell. I have no idea how to ‘ask for a sale’ in these venues. Can you please explain? Remind Ms Bonnie Glendininng that dharam bindra has to fight WW-III with you so don’t try to sit calmly and composedly. Her composition has to be transformed because she has ignited this fire ” to be successful as an artist inside me. This has really helped me get my head around writing my story, thank you! Great post. I have given some backstory but maybe i need to expand i it a bit and show how it ties into my art. And then of course my art has an effect on me and i develop and grow from that. Hopefully to produce nee better pieces. On my bio on Instagram I put something like. Parents left me when I was a toddler. Childhood was bleak and adulthood a struggle. At 50 I bought an art gallery and started to create my own work. Art can unravel torments and deliver sanity. One of those blogs that you read and don’t bored. Good job and kudos to the author!